Hoarding can cause particular hazards to the occupants of a home such as fires and unsanitary living conditions. This article is about the dangers associated with the disease. Many of us tend to hold on to sentimental things and, in some cases, things that are completely out of the ordinary. For instance, there was a woman who thought she could find a use for used plastic ketchup bottles so, she had a dozen or so stashed away in the kitchen cupboard. Hoarding, however, goes way beyond the typical, although sometimes bizarre, need to hold on to something for future use. Hoarding has now been recognized as an illness and can be a major health issue to the hoarder and to their neighbors. 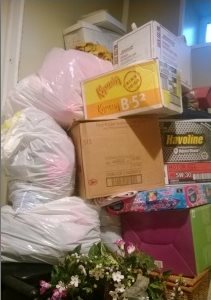 Hoarding has been brought to the spotlight with the popular shows on the cable networks highlighting the hoarders and their families. The reality is that hoarders are not able to control their need to keep items, even items that are truly trash such as used napkins. In the case of hoarding, it usually goes beyond keeping things, as the hoarder quickly becomes overwhelmed by their surroundings, resulting in things like dirty dishes piling up or stored in unusual locations, such as the stove or back in the cabinets. If there are animals in the house, they are often not properly cleaned up after or cared for. All of this can lead to major health concerns. Health concerns include the unseen, such as disease causing pathogens, to pests ranging from the barely visible, such as dust mites, to fleas, to rats. These pests cannot be removed until the house is properly cleaned up. There is always the danger of a Fire when it comes to hoarders as well, as it is common for them to lose the bills for heat and electricity so, when the utilities are cut off, the use of candles and kerosene heaters is prevalent. The combination of mounds of debris and a fire source can be deadly. If a fire does break out in the home, the firefighters have a difficult time getting to the source of the fire and possibly removing any victims from the home. Neighbors of hoarders often complain about odors, pests, and the possibility of fires spreading to their homes. Hoarders are often ashamed at the way they are living and don't like people in their homes. Therefore, the help and support of family members is important in the clean-up of a hoarder's home. We understand the complexities of hoarder situations and work with the owner to put a plan together that will get the property livable again as soon as possible. Disaster Blaster works with the family to decide what is to be thrown out and what they would like to save. It is then important for the house to be cleaned thoroughly, removing any carpets that may be contaminated or hold odors, and sanitize the home. We are concerned about our clients and make every effort to help them through the process. Even in these difficult situations, at Disaster Blaster, "We're Here for You®". If you or someone you know has a need for our services, please don't hesitate to Contact Us.